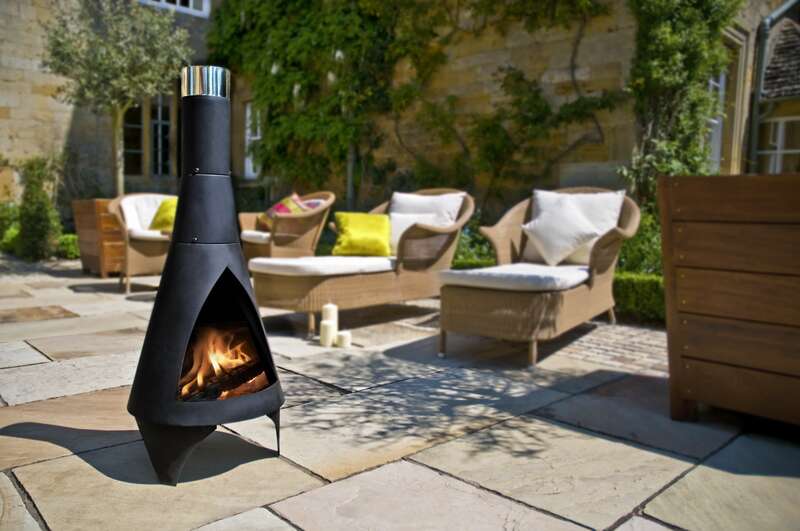 Are you looking for a suitable patio fireplace for the garden, then you have come to the right place at Firepit-online.com. In our store, you will find the largest online selection of patio fireplaces, from stainless steel patio fireplaces to cast-iron patio heaters. With an attractive patio fireplace you can create a warm and cosy terrace, even on cooler summer evenings. Firepit-online.com has a beautiful collection of outdoor fireplaces for you. Outdoor living is a huge trend that is an important aspect of life to more and more people. These days, many people include their garden life in the interior of their home. This means that we are ever keener to enjoy our gardens longer and more frequently. Are you a garden lover too? Then you might want to consider buying a patio fireplace. Patio fireplaces, also called terrace heaters or garden heaters, are available in many shapes and sizes. For example, there are also outdoor fireplaces with a barbecue grill. The most important thing, however, is that you can enjoy a crackling fire during the sultry and warmer summer evenings. Corten steel outdoor fireplaces, black outdoor fireplaces and stainless steel outdoor fireplaces ... Patio fireplaces are available mad of various materials. A common type steel is corten steel. One of the characteristics of this steel alloy is that it will not rust. The reason for this is that there is copper in this alloy. When a layer of oxide forms on the patio heater, it will, as it were, create an air sealing layer on the material. No oxygen can get through this oxide skin, so that this layer of rust is in fact a protective layer. Another characteristic feature of corten steel is that a nice, smooth rust-brown and warm colour will develop on the outdoor fireplace, fire bowl or fire pit. So you can say this is a sustainable outdoor fireplace! In addition there are patio fireplaces made of stainless steel and outdoor fireplaces of steel. Plain steel will corrode, and to prevent this from happening, outdoor fireplaces are often varnished with a heat-resistant paint, which is resistant to very high temperatures. This coating has a double task. On the one hand, it ensures that the patio fireplace is well protected against weather influences. On the other hand, this paint, which is generally black, gives the outdoor fireplace a unique look. Tip: Place an outdoor fireplace under a shelter after use, or purchase a protective cover. Although a protective cover will protect the patio heater against weather influences, corrosion can, unfortunately, never be prevented entirely. Having a snack and a drink is simply just a little cosier when there is also a fire. Marshmallows can be roasted over the fire of the fire pit, and in some cases, it can be used as a barbecue. An outdoor fireplace does not only create a wonderful ambience, but can sometimes also serve as a barbecue. In addition, the smoke will keep insects at bay, which makes summer evenings extra pleasant. Are you convinced? Then order your beautiful patio fireplace now! The choice of outdoor fireplaces is enormous. If you have made your choice, you can order the garden fireplace online. If you order before 17.00, your fireplace will be shipped the same day for a quick delivery at your place!